This is the 2nd episode of Scott Reeder’s Suspect Convictions Podcast detailing the 1998 Bloomington, IL murder case of 3-yr old Christina McNeil. Her father was convicted of her murder and sentenced to life in prison. He is fighting for his exoneration with the help of the IL Innocence Project. A simple window screen and some spider webs may be the clues that exonerate a convicted murderer. 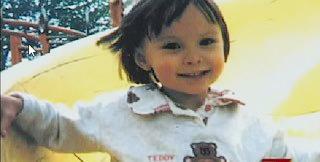 Christina McNeil, 3, who was found dead in her father’s apartment. Christina McNeil’s lifeless body was found in her father Barton’s Bloomington apartment on June 16, 1998. Barton McNeil argued that cuts in the window screen were proof that someone broke in, killed Christina and snuck out. A judge convicted him anyway, and Barton is now in prison for the crime. McNeil’s conviction is the focus of Season 2 of Suspect Convictions, a joint reporting project between GLT and investigative journalist Scott Reeder. McNeil maintains his innocence and claims his ex-girlfriend is the real killer. McLean County prosecutors say the right man is behind bars. The Illinois Innocence Project (IIP) has taken up McNeil’s case and is expected to file motions this fall in hopes of winning him a new trial. John Hanlon, IIP’s executive and legal director, said they’ll introduce new evidence that disproves the prosecution’s claim that Christina was sexually assaulted prior to her death, by showing that “artifacts” found on her body were not indicators of assault. Episode 2 of Suspect Convictions, which debuted Nov. 3 on GLT, closely examines the window in the bedroom where 3-year-old Christina was killed. McNeil told police the day of the murder he suspected his ex-girlfriend, Misook (Wang) Nowlin, snuck into his apartment and killed Christina. That theory has taken on new resonance after Nowlin was convicted in 2012 of killing her mother-in-law. Nowlin is currently serving a 55-year prison sentence. She could not be reached for comment. Barton McNeil is serving his prison sentence at Menard Correctional Center in southern Illinois. Prosecutors claimed spider webs found on the window prove an intruder couldn’t have used that as an entrance, as that would’ve disrupted the webs. McLean County State’s Attorney Jason Chambers’ office has reviewed the case and come to the same conclusion as his predecessor did: McNeil is guilty. The existence of spider webs on the window when police investigated the crime scene doesn’t mean someone didn’t break in, said Todd Blackledge, a biology professor at the University of Akron who’s studied spider webs. Certain spiders can spin webs relatively quickly, in as little as a half-hour, he said. Others take days. “There’s a lot of ambiguity. I would not feel comfortable saying a spider web precludes the possibility that window screen was opened that night. I’d need more information,” Blackledge said. I don’t understand how a new prosecutor can dismiss the possibility that an intruder killed Christina. Just look at the video and see how that window screen pops out so easily as the officer removes it. It just wasn’t fastened in it’s tracks and that’s exactly how it would act if an intruder had removed it to enter the room and then tried replacing it back in the track from outside. You just can’t put the screen properly back in place from the outside. I could understand the original prosecutor being so invested in this conviction so as to refuse to admit the prosecution was a mistake, but a new prosecutor should be impartial and her refusal in this episode to be sensible is shocking to me. The window video is so poor and grainy you can’t really tell what the spiderwebs are attached to. I think they’re a wash on this case. As a dad though, I’m troubled by what they say is coming up in the next podcast. I don’t want to think that any guy is sick enough to molest his kid. Suspect Convictions Episode 3 on Christina McNeil murder case.